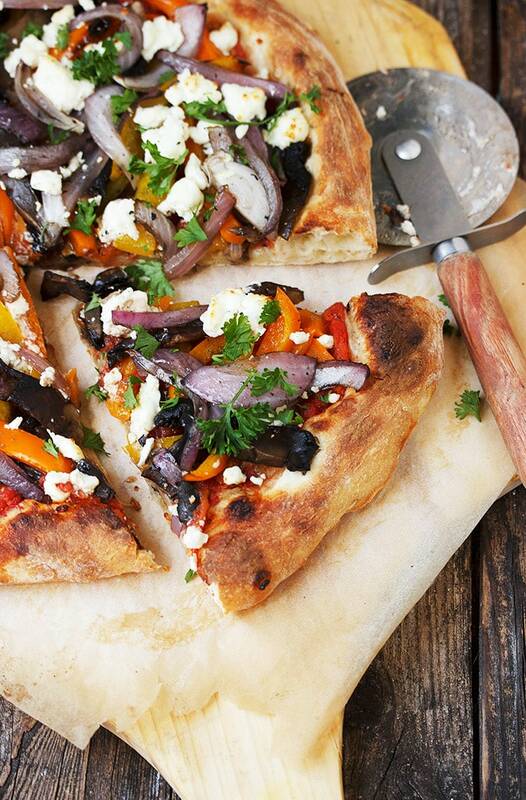 You won’t miss the meat with this Grilled Vegetable and Goat Cheese Pizza! 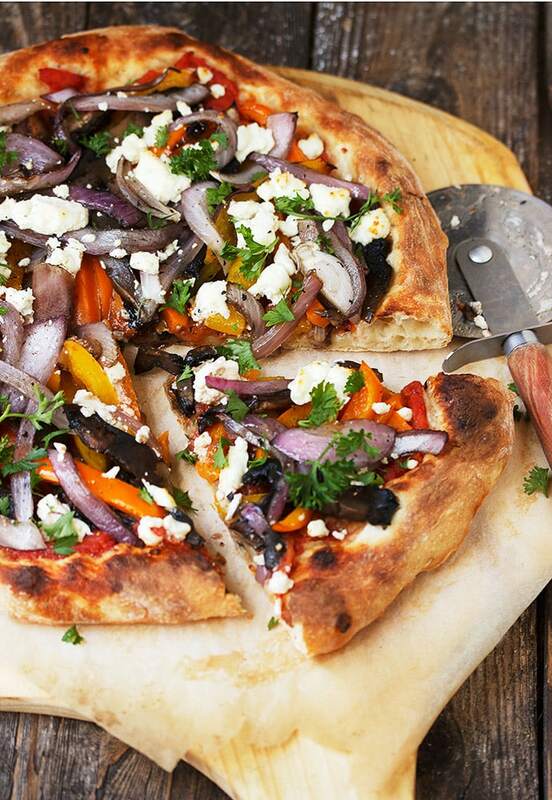 With grilled portobello mushrooms, orange and yellow peppers and red onions and topped with a generous sprinkling of goat cheese. I mentioned last week that my daughter is home for the summer and that she came home with a raging sweet tooth. Well, she also came home pretty firmly settled into the vegetarian camp. Truth be told, she was never a meat lover as a child. She never really enjoyed the taste and texture of meat and I recall her spending a lot of time just moving it around the plate. So this change in eating habits is hardly surprising. It has, however, made for some minor adjustments to this meat-eating household. While she’s quite happy to eat around our meat dishes, eating the sides with maybe an extra serving of something, I’ve been trying to think up a few vegetarian dinners that we can all enjoy (and when I say “we”, I guess I really mean my meat and potatoes husband ;) This grilled vegetable pizza is hearty enough for all of us. My pizza started with Jim Lahey’s no-knead pizza dough crust. It’s my favourite. I won’t include the recipe here, because it’s all over the internet. I usually make a half-batch, which will make two 12-inch pizzas. A store-bought dough would be fine as well. While I am usually a thin-crust lover, I like to keep it a little thicker for this type of pizza, to keep all the toppings safely on top. Rather than a pizza sauce, I used hand-crushed canned plum tomatoes, mixed with salt, pepper and a bit of oregano and simmer down to a thick sauce. If you’re in a hurry, you don’t even have to simmer it. Simply put some hand-crushed canned tomatoes right on to your pizza. I go back and forth as to whether I like this pizza best with goat cheese or feta. They are both great and honestly, it’s a toss up. Goat cheese is a tangy, creamy foil for the veggies, while feta is a nice, salty bite. You can’t lose, either way. Ooops … I was in such a hurry to get some photos so I could eat this pizza, that I forgot to put the balsamic glaze on top. It’s a must for me, so if you have some, I highly recommend. A splash of regular balsamic on your grilled veggies before baking would also work well. This is a rather loose recipe. The quantities depend on how big or how many pizzas you are making. I like to grill a lot of veggies, as any leftovers are great for sandwiches or salads, so they never go to waste. Pre-heat your BBQ (or grill pan) to medium-high. Place cut vegetables in perforated grilling basket and grill until soft and starting to brown. Remove from BBQ and set aside while you assemble your pizza. At the same time, hand-crush tomatoes from a can of good plum tomatoes. Season with salt, pepper and some oregano and simmer on the stove-top over medium-low heat until thickened. Set aside to cool a bit. (*Note: if you're in a hurry, you can skip the simmering and just place some hand-crushed tomatoes right on to your pizza dough). Pre-heat oven to 500° F. with pizza stone on middle rack (if using). Press out your pizza dough and spoon on tomatoes or pizza sauce. Top with grilled vegetables and top with crumbled goat cheese. Bake in pre-heated oven for 10-15 minutes, until crust is golden and toppings are hot. 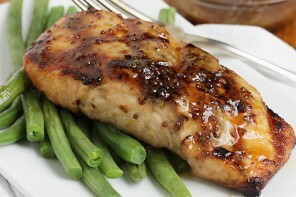 Top with a drizzle of balsamic glaze and sprinkle with chopped parsley, if desired. This recipe is perfect! 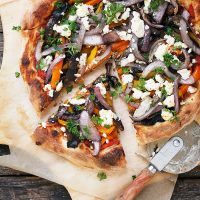 Creamy goat cheese, roasted veggies, pizza dough…I’m in and drooling over these incredible photos! I would like to try this, but do not have a grill. How would you adapt the veggies using an oven? Also, how would I make a balsamic glaze? Thanks! Thanks Mel. It’s one of my favourites! This looks phenomenal! I LOVE goats cheese, and that combined with roasted veges and what looks like the perfect pizza crust (beautiful photos, by the way!) puts it very firmly on the to make list. 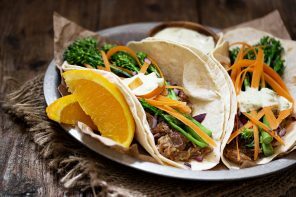 I’m not a vegetarian myself but try not to eat meat every night, so it is great to find recipes that are filling enough for everyone in the family to enjoy. 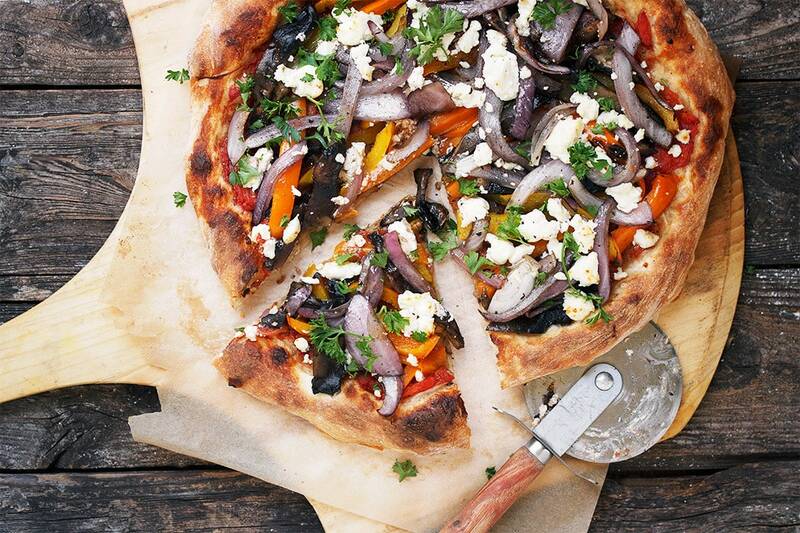 This is such a gorgeous pizza, love the grilled vegetable topper! I’m crazy about the Jim Lahey pizza dough, once you try it you certainly get hooked. I can see how I could get hooked on this pizza too. Who needs meat when you have such a great and hearty veggies. Grilled veggies and goat cheese are, to me, a match made in heaven. This is sooo awesome for Spring! I love roasted vegetables with goats cheese – it’s the best! Grilled pizza is on my list – just can’t have enough pizza at my house. This is beautiful and I bet you didn’t miss the meat. We are not meat-less enthusiasts but don’t mind eating more vegetables especially if they look like this! 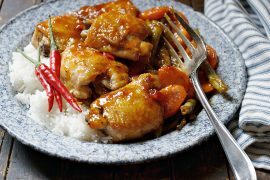 Wonderful photos and great recipe. I bet your daughter is happy to be home with meals like this! Jennifer, these are my favorite pizza toppings! Can’t wait to try! Thanks Mary Ann. One of my favourite pizzas! After the stunning photo I will say your first paragraph could have been written about my daughter (come to think of it I went vegetarian in college too; what’s that about do we think?!). She’s teetering on the age now (16) of no meat and that does cause a rethink, doesn’t it? Anyone would love this pizza, meat eaters included. A feast for the eyes and the palate. Thanks so much, Toni :) I think it had a lot to do with the fact that she was cooking for herself. I think she just decided she didn’t like meat enough to pay for it and cook it, so she didn’t. And I guess she didn’t miss it!